The mononuclear phagocytes (dendritic cells and macrophages) are closely related immune cells with central roles in anti-infectious defense and maintenance of organ integrity. The canonical function of dendritic cells is the activation of T cells, whereas macrophages remove apoptotic cells and microbes by phagocytosis. In the kidney, these cell types form an intricate system of mononuclear phagocytes that surveys against injury and infection and contributes to organ homeostasis and tissue repair but may also promote progression of CKD. This review summarizes the general functions and classification of dendritic cells and macrophages in the immune system and recapitulates why overlapping definitions and historically separate research have created controversy about their tasks. Their roles in acute kidney disease, CKD, and renal transplantation are described, and therapeutic strategy to modify these cells for therapeutic purposes is discussed. All nonlymphoid tissues, including the kidney, harbor an intricate network of tissue-resident mononuclear phagocytes, which include dendritic cells (DCs) and macrophages. Macrophages were originally described >150 years ago by Slavjanski and Metchnikoff, and DCs were described by Steinman in 1973. These cell types are ontogenically related, and both serve sentinel roles but possess distinct hallmark functions. Macrophages are professional phagocytic cells that maintain tissue homeostasis (for example, by removing apoptotic cells) (Figure 1). During infection, they combat microbes by phagocytosis and production of toxic metabolites. Furthermore, they alert other immune cells by secreting proinflammatory chemokines and cytokines (1). Canonical functions of renal dendritic cells (DCs) and macrophages. Kidney DCs (orange) gather antigens (here represented in green as microbes) and transport them to draining lymph nodes to present them to specific T cells (red). Tissue-resident DCs can regulate activated T cells. Macrophages (violet) maintain tissue homeostasis, for example, by removing apoptotic cells. During infection, they may combat microbes by phagocytosis. The canonical function of DCs is the activation of T cells (2). To this end, they gather antigens in tissues and transport them to draining lymph nodes to present them to specific T cells (3) (Figure 1). Immunogenic T-cell activation requires the DCs to have sensed pathogen-associated molecular patterns (PAMPs) or danger-associated molecular patterns (DAMPs; for example, bacterial cell wall components, like LPS). Without sensing such patterns, DCs remain in an immature functional state and cause antigen-specific T cells to undergo apoptosis. This is one major form of so-called peripheral tolerance, which serves as a second checkpoint (after thymic tolerance) against T-cell responses against autoantigens that are usually devoid of PAMPs (4). By contrast, DCs that have matured after sensing PAMPs or DAMPS can induce vigorous proliferation of specific T-cell clones, which are released into the circulation to infiltrate infected tissues to combat the pathogens. In addition to DCs that migrate into lymph nodes, there are tissue-resident DCs that regulate infiltrating effector T cells by producing cytokines and chemokines (5,6). As a rule of thumb, macrophages are innate immune effector cells, and DCs induce adaptive immunity. Their sentinel and regulatory functions overlap, and the functionally dominant cell type depends on their tissue of residence. In this review, we will summarize the phenotypical and functional characteristics of macrophages and DCs in the kidney and describe their role in acute renal injury and CKD. Several DC classification system have been defined in mice and humans on the basis of the expression of subset markers and functional properties (Table 1). Many authorities distinguish CD11b-like myeloid DCs (mDCs), CD8-like mDCs, Langerhans cells (important only in the skin and not further considered here), plasmacytoid DCs (pDCs), and inflammatory DCs (7–9). mDCs and pDCs are derived from a distinct DC precursor in the bone marrow, whereas inflammatory DCs, like inflammatory macrophages, originate from monocytes (10). The CD11b-like mDCs preferentially activate CD4+ T helper cells, the CD8-like mDCs are specialized at activating CD8+ cytotoxic T cells, and pDCs induce direct antiviral immunity by secreting type I IFNs. Inflammatory DCs can perform all of these functions and serve as a rapid supply of additional DCs in situations of need, such as infections. For more information on these important functions of DCs in mice and humans, we refer to recent excellent reviews (6,9,11). Macrophages have been classified in the last decades according to the M1/M2 or the classic/alternative activation dichotomy, with the former performing proinflammatory antibacterial responses and the latter being involved in antiparasite immunity and tissue repair (12–14). However, these functions seem to represent merely two ends of a broad spectrum of macrophage polarization states (15). Another classification system uses the Ly6C marker to distinguish inflammatory and tissue-resident macrophages, which seem to perform distinct tasks in the anti-infectious defense (16,17). This difference is also evident in blood monocytes: in addition to the classic Ly6C+ inflammatory monocytes that are dependent on the chemokine receptor CCR2, a distinct subset of Ly6C− monocytes expressing high levels of the chemokine receptor CX3CR1 has been described (18). The latter seem to act as vascular sentinels that survey endothelial surfaces and may cause vasculitis and organ damage, which was explicitly shown in the kidney (19). Recent work showed numerous other functional states of macrophages (20,21). This heterogeneity is further complicated by the discovery that certain tissue-resident macrophages, such as microglia and Langerhans cells, originate from not only the bone marrow but also, primitive precursors in the yolk sac and perhaps, the fetal liver (22,23). This finding has major implications for therapeutic strategies, because macrophages derived from primitive precursors seed organs before birth and multiply by local proliferation rather than recruitment from the circulation (24,25). Obviously, tissue-resident macrophages cannot be targeted by preventing their tissue recruitment in contrast to bone marrow–dependent macrophages. The classification of human tissue DCs and macrophages is less developed than that in mice because of technical limitations (21). The realization that macrophages can also perform DC functions to a certain degree and vice versa has caused much uncertainty and debate about the exact demarcation between these two cell types. To understand this ambiguity, one has to remember that the fields of DC and macrophage research have historically developed more or less independent from each other. The marker molecules used to identify these cells considerably overlap; most notably, the murine DC marker CD11c used over three decades to distinguish DCs from macrophages is known to also be expressed by certain macrophages (for example, in the lung or the splenic marginal zone) (9,23). Likewise, the macrophage marker F4/80 is expressed by DCs in most nonlymphoid tissues, including the kidney (26) (Table 1). The systems commonly used to deplete DCs or macrophages for loss-of-function in vivo studies are often on the basis of these markers, and consequently, they are not specific either (27). Thus, many studies addressing either tissue macrophages or tissue DCs were unknowingly studying the same cells, often neglecting knowledge from the other discipline. In fact, the same mononuclear phagocyte may simultaneously fulfill the current criteria used by the DC community and those used by the macrophage community, because their definitions are not mutually exclusive. Of course, semantic debates are of little importance to clinicians, let alone to patients. Therefore, many serious immunologists are currently discussing how to replace the numerous coexisting classification systems with a new system that is acceptable to both communities (28). Such a system will likely leave the current DC-macrophage dichotomy behind and encompass ontogenetic and functional properties. Before a consensus is reached, we will here adhere to the current nomenclature, which classifies renal mononuclear phagocytes expressing CD11c as DCs and those lacking this marker as macrophages. DCs and macrophages express a great variety of receptors to sense microbial PAMPs. The best studied examples are the Toll-like receptors (TLRs), which detect cell wall components of gram-positive and -negative bacteria, flagellin, and bacterial and viral RNA and DNA. In addition, TLR2 and TLR4 also recognize self-components that are normally sequestered but released in situations of stress, sterile inflammation, or cellular damage. Such DAMPs signals generally include molecules like HMGB1, heat shock proteins, or fibronectin. DAMPs with more or less specificity to the kidney include uromodulin (Tamm–Horsfall protein), hyaluronan, and biglycan (29–31). Table 2 lists these classes and additional classes of pattern-sensing receptors expressed by DCs and macrophages such as lectins, like the mannose receptor, dectins, or DC-SIGN, which recognize carbohydrate moieties, especially of microbial origin (32). Retinoic acid-inducible gene 1–like helicases are intracellular sensors that detect the presence of viral nucleic acids in the cytoplasm, whereas nucleotide-binding oligomerization domain receptors-like receptors recognize intracellular bacterial PAMPs (33). Much attention has recently been given to the NLRP3 inflammasome (Figure 2A), a large molecular complex that, in response to various types of crystals (e.g., silica, asbestos, cholesterol, Alzheimer fibrils, and islet amyloid polypeptide), proteolytically activates in phagocytes IL-1, an inflammatory master regulator (34). Numerous other receptors deliver additional information (for example, cytokine receptors that inform about the activation state of neighboring cells, metabolic sensors that detect consumption of nutrients, or even neuronal synapses that provide a direct link to neural regulation). DCs and macrophages integrate all this information, respond with activation or maturation, and become proinflammatory. Numerous experimental studies have examined the role of these sensors in models of various diseases, including those affecting the kidney, and promising candidates for therapeutic intervention have been identified (35). However, most of these studies used mice ubiquitously deficient for these sensors, and therefore, it is unclear whether an observed beneficial affect can be attributed to DCs or macrophages. Role of renal DCs and macrophages in selected kidney diseases. (A) Inflammasome activation in DCs and macrophages results from intratubular crystal formation, which is a consequence of the high osmolarity in the medulla that favors crystal formation. The inflammasome is an intracellular multimeric enzyme complex that contains adaptor proteins and caspase 1, which proteolytically activates IL-1β, resulting in inflammation. (B) Ischemia reperfusion injury activates DCs to produce TNF and chemokines that attract and stimulate injurious immune effector cells. (C) Glomerular inflammation activates periglomerular DCs in the renal cortex. They capture and present deposited or filtered antigens to CD4 T helper cells and stimulate these cells with IL-12. T cells secrete IFN-γ and cause macrophages to produce injurious mediators, like TNF or nitric oxide (NO). DCs, dendritic cells; MΦ, macrophage. The tubulointerstitium of healthy kidneys contains numerous CD11c+ cells with extensive dendritic protrusions that can be classified by phenotypic and functional properties as tissue DCs of the CD11b type (Figure 3, Table 1) (26,36). Most of these DCs comply with some definitions of tissue macrophages (for example, in terms of F4/80 expression) (21,37). A recent detailed study showed that the murine kidney contains at least five discrete subpopulations of mononuclear phagocytes, which cannot be simply classified into the conventional entities, because they performed both traditional DC and macrophage functions to differing degrees (38). Cells with predominant DC functionality are more abundant in the cortical tubulointerstitium but mostly absent from the glomeruli (39,40). Only 5% of the tubulointerstitial DCs belong to the CD8-like subset that has exclusive DC functionality (41), but their role in the kidney is unknown. Cells with unambiguous macrophage phenotype can be found in small numbers within glomeruli (42) and in the subcapsular and periarterial connective tissues (43,44). Renal macrophages expressing very high levels of F4/80 originate mostly from the yolk sac (22) and are more abundant in the medulla (40). Renal mononuclear phagocytes are partially derived from common DC precursors and monocytes (45). The renal mononuclear system. 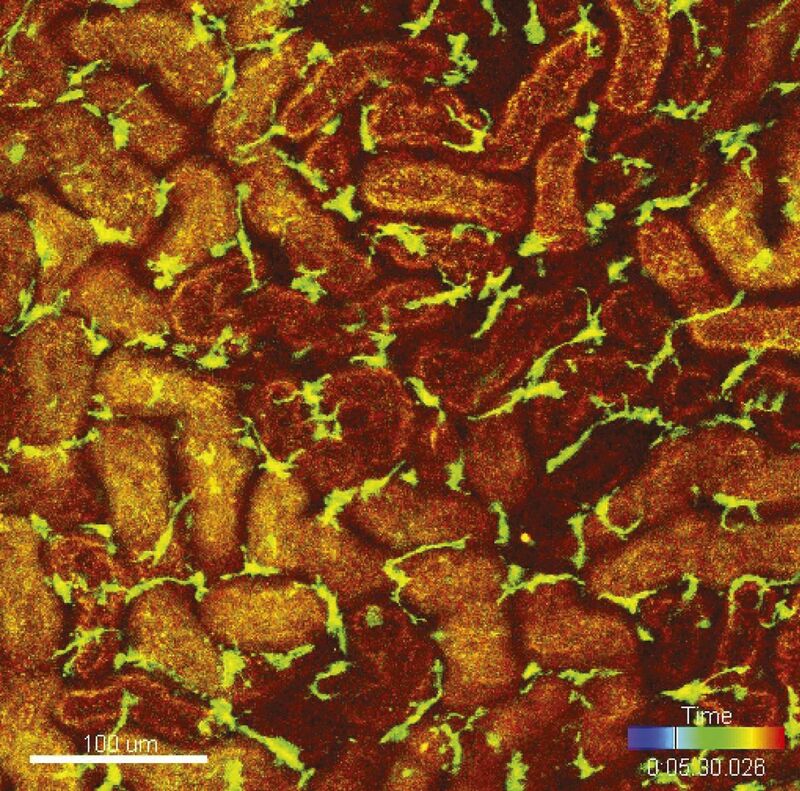 Two-photon microscopy image of the renal mononuclear phagocyte system visualized by transgenic reporter mice in which cells, which include DCs, macrophages, and monocytes, harboring the receptor CX3CR1 express green fluorescent protein. Reprinted from A. R. Kitching, with permission. Most of these observations were made in mice, where numerous experimental tools are available. Extrapolation to the human system is not straightforward, because the subset markers differ substantially between species. This may be one reason why, until now, only a few studies have examined DC and macrophage subsets in human kidney biopsies (46–48). These revealed new insight into old disease entities, such as shifts in the distribution and numbers of myeloid cells (identified in humans by the BDCA-1 marker) in lupus nephritis and necrotizing GN (47). There is great potential in this area to improve the histopathologic diagnosis of nephritis. Kidney DCs constantly probe their environment using their dendrites, suggesting a sentinel role (26,36,46,49). Indeed, DCs in healthy kidneys continuously sample glomerular and tubular self-antigens and small molecular weight antigens that can constitutively pass the glomerular filter from the tubular lumen (50). It is unclear whether DCs do so by extending dendrites between epithelial cells into the tubular lumen as described for the intestine (51). In the absence of PAMPs, DCs express the suppressive molecule PDL-1 that induces apoptosis in T cells specific for such antigens (52). This function may serve to maintain immunologic tolerance against renal autoantigens or innocuous circulating small molecular weight antigens. However, this tolerance mechanism is undermined in diseases associated with proteinuria. 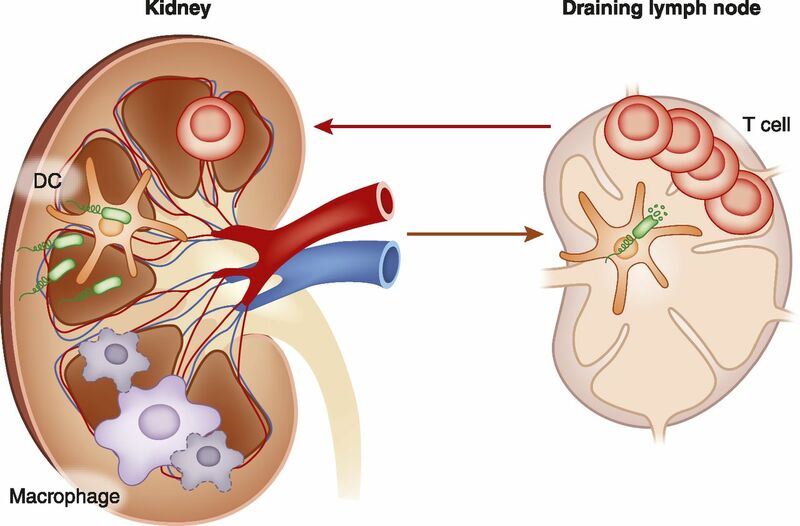 When the glomerular filter becomes leaky, kidney DCs receive more proteins and in addition, high molecular weight antigens that stimulate potentially harmful T cells—another way that proteinuria can injure the kidney. Renal DCs and macrophages use TLR4 to detect uropathogenic Escherichia coli (53,54), the most prevalent cause of kidney infections. DCs respond by producing chemokines that recruit neutrophilic granulocytes into the kidney to combat the bacteria by phagocytosis and production of toxic mediators (55) (Figure 4A). The DCs in the renal medulla are particularly potent at recruiting neutrophils (40), perhaps because they are the first to encounter the ascending bacteria and/or because of microenvironmental cues that cause them to specialize at anti-infectious functions. Notably, kidney macrophages contributed to neither the chemokine production nor the phagocytosis of uropathogenic E. coli (55). By contrast, another study reported that renal macrophages are critical for the defense against candida (56), which preferentially infect murine kidneys. The phenotype of the macrophages in that study (MHC II+, F4/80+, and CX3CR1+) resembles that of the DCs examined in the E. coli study, highlighting the current nomenclature ambiguity resulting from overlapping definitions as described above. Immune response against urinary tract infection. (A) In bacterial pyelonephritis, ascending uropathogenic E. coli (green) is sensed by Toll-like receptor (TLR) -expressing kidney DCs positioned in the medulla adjacent to collecting ducts and tubules. Medullary DCs respond by secreting CXCL2 that attracts neutrophils to eliminate the bacteria. (B) In bacterial cystitis, resident Ly6C− sentinel macrophages sense uropathogenic E. coli and start secreting chemokines to recruit circulatory neutrophils and Ly6C+ monocytes. The latter differentiates into Ly6C+ helper macrophages that release TNF as helper signal, which enables Ly6C− sentinel macrophages to produce additional chemokines to guide neutrophils into the frontline of infection (the uroepithelium) to combat the bacteria. MIF, macrophage migration inhibitory factor. By contrast, the defense against bacterial cystitis entirely depended on macrophages (more exactly on the interplay between two functionally distinct macrophage subsets that can be distinguished by expression of the Ly6C marker) (16) (Figure 4B). 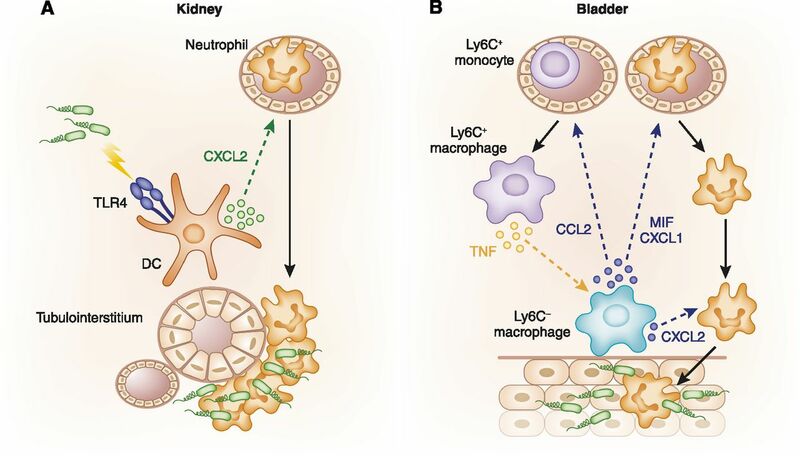 Bladder-resident Ly6C− sentinel macrophages performed a role comparable with the role of DCs in the kidney: they sensed the infection and produced chemokines that recruited neutrophils and Ly6C+ monocytes. The latter did not directly combat bacteria but instead, performed an innate immune helper cell function. After sensing the infection, they produced the cytokine TNF as a helper signal that caused the sentinel macrophages to produce additional chemokines to guide neutrophils into the frontline of infection (the uroepithelium) to combat the bacteria. These findings showed that the immune system bases the decision of whether to induce antibacterial innate immunity on the agreement between several immune cells, probably to reduce the likelihood of false-positive decisions that would cause collateral damage—a principle well known from T- and B-cell responses of the adaptive immune system. These findings also help to explain why TNF is so important in antibacterial infection and why TNF-blocking therapies cause exacerbation of bacterial infections, including urogenital tract infections (57). It is unclear whether similar collaboration also occurs in the kidney during the defense against pyelonephritis. The finding that different myeloid cells act as sentinels in bladder and kidney highlights the close relationship between DCs and macrophages and the importance of microenvironmental factors that shape the local immune system. Exact knowledge of the mechanisms of antibacterial defense is important for designing superior therapies with minimal side effects. Acute and chronic kidney inflammation is usually associated with the intrarenal accumulation of DCs and macrophages. Macrophages are widely considered important sources of proinflammatory cytokines and injurious mediators in various types of acute kidney diseases (58). In ischemia reperfusion injury (IRI), an important problem in kidney transplantation, kidney-resident DCs are the first to produce proinflammatory chemokines and cytokines like TNF (59), suggesting a proinflammatory role (Figure 2B). 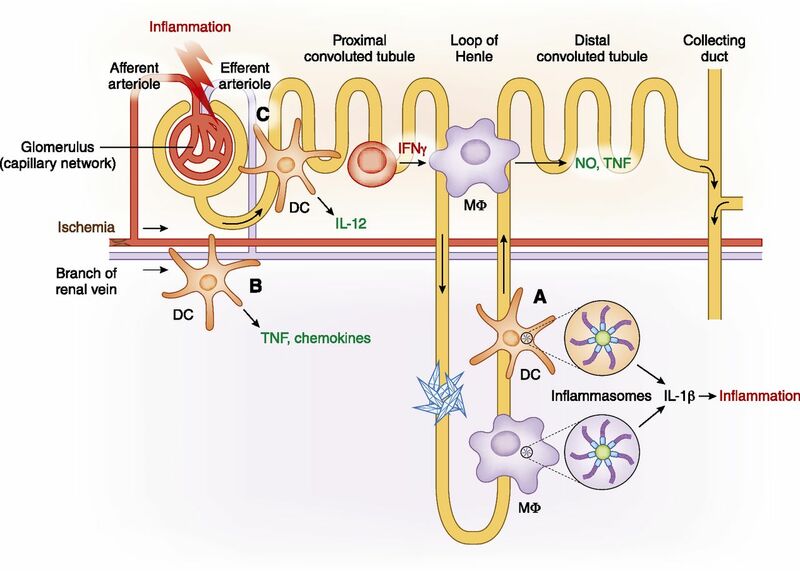 However, functional studies showed that kidney DCs prevented excess ischemic tissue damage (60,61), which has been linked to anti-inflammatory signaling mechanisms involving IFN regulatory factor 4 and immunosuppressive mediators, like IL-10 and single Ig IL-1–related receptor (62). Protective functions of DCs have also been shown in models of drug-induced tubulotoxicity (63) and acute crescentic GN (64), which may be mediated through the inducible costimulatory ligand on DCs (65), a T-cell suppressor. However, these studies have to be interpreted with caution, because they were obtained with the use of experimental techniques that may be associated with systemic neutrophilia as a side effect (66). Some studies may need to be revisited to clarify an influence of side effects. After acute injury, both DCs and CSF-1–dependent macrophages orchestrated tissue repair by producing mediators like IL-22 (67,68), suggesting novel therapeutic avenues in both transplantation and acute tubular necrosis. Persistent signaling through pattern-sensing receptors causes resident DCs to mature and become proinflammatory. Furthermore, chronic kidney inflammation attracts circulatory monocytes through chemokines. These differentiate within the kidney into DCs and macrophages with proinflammatory functionality, which progressively replace resident immature DCs. Thus, the renal environment turns more and more proinflammatory and supportive of CKD progression. This functional change has been described in murine models of crescentic GN (40) and lupus nephritis (69). Matured DCs stimulated T helper cells, which produced cytokines like IFN-γ to activate renal macrophages to mediate kidney damage (Figure 2C), consistent with a type IV delayed type hypersensitivity reaction (70). This immune cell cross-talk may be the mechanistic explanation for the well known mononuclear periglomerular infiltrates regularly observed in many forms of GN (71). It is well established that the extent of tubulointerstitial mononuclear infiltration correlates with the kidney function and its prognosis in many types of CKD, including those not primarily by the immune system (like diabetic or hypertensive nephropathy) (71), suggesting a general role of tubulointerstitial immune cell cross-talk in CKD progression. Thus, the histopathologic diagnosis of nephritis may be advanced by considering functional parameters, like the DC maturation state (72), the T cell cytokine production, or macrophage activation. Immune cell cross-talk is also important in lupus nephritis, a renal manifestation of a systemic immune disorder resulting from a defect in the homeostatic clearance of apoptotic cells (73), sensing of the accumulating self-nucleic acids that mimic a viral infection (74), and the ensuing loss of immune tolerance to nuclear autoantigens (75,76). In addition to mDCs, pDCs also play an important role in this condition by sensing nucleic acids antigens using TLR7 and TLR9 and driving intrarenal inflammation by secretion of type 1 IFN (74). Lupus nephritis is one of two conditions in which DCs infiltrates in glomeruli have been described (77), the other one being ANCA-associated GN (78). DCs play a minor role in CKD driven by mechanic or toxic injurious mediators. The best studied example is unilateral ureteral obstruction, the standard kidney fibrosis model. Although both DCs and macrophages showed signs of activation, only the removal of macrophages (but not DCs) attenuated kidney fibrosis (79,80). The important functional role of macrophages explains the correlation between their intrarenal numbers and the severity of fibrosis in human studies (81). Mechanistically, activated macrophages secreted reactive oxygen species and proinflammatory cytokines, which induced apoptosis of tubular epithelial cells and stimulated interstitial fibroblasts to deposit extracellular matrix, leading to kidney fibrosis (82,83). Several macrophage-activating receptors have been described with inhibition that may be of therapeutic value in nonimmune CKD (84–86) (Table 2). Many forms of sterile inflammation are driven by inflammasome activation and important for the nephrologist, usually lead to tissue fibrosis (34). The kidney is predisposed to inflammasome activation, because the concentration of the primary filtrate and the high osmolarity in the renal medulla favor crystal formation after the solubility coefficient of a given salt is exceeded within the tubular lumen (Figure 2A). Indeed, it has been reported that calcium oxalate crystals activate the inflammasome in renal DCs (87), which may cause progressive loss of kidney function over weeks (88). Additional examples of inflammasome-activating nephrotoxic crystals are formed by uric acid (resulting in gout nephropathy) and adenine (89), which is released, for example, during chemotherapy. Experimental studies have also shown a role of the inflammasome in IRI (90) and unilateral ureter ligation (91). Numerous stimuli other than crystals have been reported to trigger the inflammasome, but it is unclear which of them are important in these conditions. Regardless of the underlying reasons, inhibition of the inflammasome product, IL-1, has recently been used successfully in many forms of sterile inflammation (92), albeit not yet in those affecting the kidney. Furthermore, small molecular weight inhibitors of the inflammasome itself are currently being developed and tested. Finally, it might be possible to prevent inflammasome activation by targeting the renal cells in which it is expressed (the DCs and macrophages). Renal allograft rejection results from the recognition of graft antigens that provoke an immune response of the recipient (93). DCs are central to both the direct and indirect allorecognition pathways, where donor antigens are presented to recipient T cells by donor or recipient DCs, respectively. Direct recognition may contribute to acute allograft rejection (94), whereas indirect recognition causes chronic allograft rejection and alloantibody formation (95). This is logical, because recipient B cells need to receive recipient T-cell help, which can be stimulated only by recipient DCs. Donor DCs possess a limited half-life and can contribute to rejection only in the acute phase. During that phase, donor DCs are exposed to IRI-mediated damage that renders them particularly stimulatory. IRI can be studied in animals much more easily than full organ transplantation, and therefore, abundant information is available on the molecular mechanism of IRI, showing, for example, the potent production of proinflammatory cytokines (59). Consistently, the analysis of human kidney biopsies showed that a strong mDC influx during acute rejection predicts a poor outcome (96). The transfer of tolerogenic donor-derived immature DCs before kidney transplantation seems to be a promising therapeutic strategy to prevent proinflammatory functions of kidney passenger DCs. Such donor DCs can promote alloantigen-specific T-cell unresponsiveness and transplant survival (97). Inhibition of T effector cells and induction of regulatory T cells were observed in volunteers treated with DCs (98,99). These effects may be augmented by immunosuppressive therapies (100). Transfer of activated macrophages as Ehrlich's magic bullets that migrate into sites of inflammation has been shown to aggravate kidney disease (101), consistent with the proinflammatory function of these cells. By contrast, the transfer of macrophages genetically modified to express immunosuppressive mediators attenuated inflammatory kidney disease (102,103). It remains to be seen whether such genetic modifications are stable and safe enough for therapeutic use in humans. The depletion of renal DCs and macrophages is the most straightforward approach to prevent their disease-aggravating effects in CKD. In animals, this can be achieved with the use of clodronate liposomes, which are not specific for DCs or macrophages. More specific are the numerous transgenic tools previously used in vivo for loss-of-function experiments, which allow determination of how disease models develop in the absence of DCs and/or macrophages. However, current techniques do not permit their selective removal from the kidney to preserve their anti-infectious activity in other organs. Additionally, it is unclear whether the ensuing side effects would be tolerable in humans. DC and macrophage recruitment into the inflamed kidney can be inhibited by blocking the chemokine receptors involved. The receptor CX3CR1 mediates the homeostatic colonization of the kidney (but not other organs) with DCs, except the intestine (40). Therefore, CX3CR1 should represent a highly desirable therapeutic target, because its inhibition should entail fewer side effects in other organs. However, under inflammatory conditions, CX3CR1 is not the only receptor mediating monocyte recruitment; also, CCR1, CCR2, and CCR5 have been implicated (104,105). It remains to be seen whether and how much these receptors can compensate when CX3CR1 is blocked. Particularly, CCR2 is important for proinflammatory macrophages, and its inhibition (or inhibition of its ligand CCL2) was effective in mouse models of unilateral ureter ligation (79), lupus nephritis (106), ischemia/reperfusion (107), and diabetic nephropathy (108). Chemokine receptors can be targeted well by small molecular weight drugs; some of these are currently under investigation, but their value for treating kidney disease is unclear at present. Finally, some immunosuppressive drugs, such as laquinimod, have been shown to reduce chemokine secretion and immune cell infiltration in other tissues and may be of use in nephritis (109). Another promising approach is to inhibit DC maturation, the prerequisite for their ability to aggravate chronic disease. An obvious candidate is the transcription factor NF-κB, a master regulator of immune cell activation, which offers the additional advantage of also being active in two additional main components of renal mononuclear infiltrates (T helper cells and macrophages). NF-κB inhibitors have been used successfully in several immune-mediated diseases, including SLE (110), but have not yet been used successfully in primary CKDs. Interestingly, the effectivity of type I angiotensin receptor blockade in CKD is partially mediated through inhibition of macrophages, which express this receptor as well (111). Table 2 lists additional receptors important in CKD with the potential to modify DC or macrophage activation. Some of the immunosuppressive agents used to prevent transplant rejection prevented DC activation in vitro (for example, sirolimus  and tacrolimus ). However, their usefulness in CKD is limited by side effects. Finally, the numerous recent inhibitors of proinflammatory cytokines produced by DCs and macrophages possess therapeutic potential, but these drugs will be discussed in another review of this series. This work was supported by the German Research foundation (KFO228, SFBTR57). C.K. is a member of the excellence cluster ImmunoSensation in Bonn.